Academic research related to a specific investment strategy can be very useful to understand specific characteristics of the strategy as well as to understand how the strategy has performed across market cycles. After publishing the article Collecting Pennies In Front Of A Bulldozer: How Likely Are You To Be Run Over? a reader was kind enough to point me to several academic and industry studies related to merger or risk arbitrage. This page contains a list of those academic studies. If there is a new study worth including on this page or an old one that we missed, we would appreciate it if you would let us know. 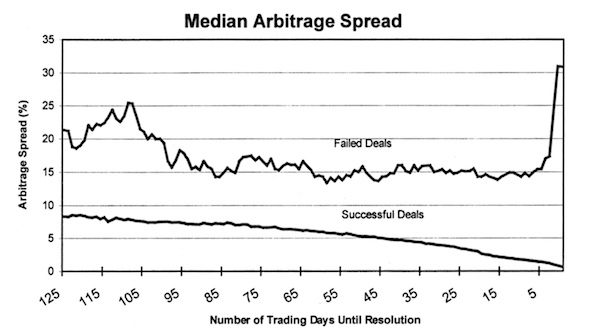 One interesting insight from the paper Characteristics of Risk and Return in Risk Arbitrage by Mark Mitchell and Todd Pulvino was particularly useful as it showed that deal spreads for failed mergers were larger right from the start and tended to increase in the days before the deals failed as you can see from the chart below. Abstract: As it is usually defined, risk arbitrage involves purchasing the stock of the target firm in a takeover attempt that has been publicly announced. Once the sole domain of the professional investor, merger and acquisition arbitrage has recently attracted a considerable amount of “outside” capital. A consequence of this increased speculative participation is that the post-announcement stock prices of the merging firms reflect the market’s consensus prediction that the venture will ultimately be successful. This paper presents a simple technique based on the mechanics of the risk arbitrage process for estimating the probability of a successful corporate takeover. Empirical evidence is provided to support the conclusion that the market can meaningfully discriminate between those merger proposals that will be completed and those that will eventually fail far in advance of the actual outcome. Abstract: This paper analyzes 4,750 mergers from 1963 to 1998 to characterize the risk and return in risk arbitrage. Results indicate that risk arbitrage returns are positively correlated with market returns in severely depreciating markets but uncorrelated with market returns in flat and appreciating markets. This suggests that returns to risk arbitrage are similar to those obtained from selling uncovered index put options. Using a contingent claims analysis that controls for the nonlinear rela- tionship with market returns, and after controlling for transaction costs, we find that risk arbitrage generates excess returns of four percent per year. Abstract: Regulatory and technological changes have resulted in a surge in merger and acquisition (M&A) activity in the newspaper industry since the 1980s. This study investigates the “success” of these M&As focusing on a particular facet of acquisition performance, the completion likelihood of an announced transaction. We are motivated by the large number of M&A transactions that are announced but later abandoned prior even to their official consummation date. Based on a sample of M&As from the newspaper industry (1981-2000), we identify several attributes that influence the likelihood of completion of M&As involving newspaper companies. We find that although firm-level characteristics are relevant, transaction-specific factors and regulatory aspects of the focal M&A are even more important. Not surprisingly, the attitude of the transaction (whether hostile or friendly) is a key factor, but other features such as the method of payment as well as the percentage sought by the acquirer also constitute major influences on whether an M&A deal is ultimately consummated. The latter factor in particular, re-affirms the prevailing view on the importance of regulatory influences on media M&As. Abstract: The market implied volatilities for target stocks during the period between an acquisition announcement and the transaction resolution were examined for di erences between samples of successful and failed transactions. By constructing volatility ratios for all cash and pure stock swap transactions, I nd that market implied volatilities for successful and failed transactions diverge over time for cash bids but not stock bids. Abstract: This document is a quantitative analysis of risk arbitrage strategy across a sample of 1,911 M&A deals announced between January 1998 and September 2010 in the US and Canada. The study quantifies the main specific risk factors for each merger & acquisition deal from a probabilistic standpoint. It emerges that the biggest risk factors are: intent of the offer (hostile or friendly), buyer typology (industrial or financial), the relative size of the buyer compared to the target and the risk arbitrage spread calculated over the first five days following the announcement of the bid. Ultimately, it is hoped that this document will provide managers with an interpretation of the mergers & acquisitions market as well as a decision-making tool to complement traditional qualitative analysis. Asif Suria: As the press release indicated Connecticut is not willing to ..
GeorgeCiardi: Is the CTWS / SJW deal officially over? Or is there still ho ..
Asif Suria: Thanks Tommy. Looks like Seeking Alpha is getting more aggre ..
Tommy Carstensen: Thanks for this. It might be worth noting, that there is no ..
Asif Suria: Thanks George. Our understanding of this deal was that Taked ..